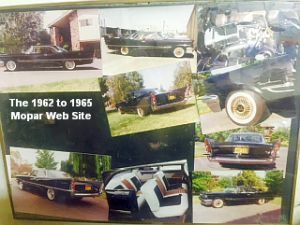 David writes: I had always wanted a 1962 Dodge B-Body but in a search for nearly 40 years the effort was futile. 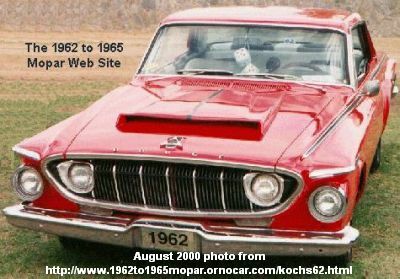 Most were cut up in the 1960's to serve as drag cars. One day while reading a daily Hemmings this one was featured as the Car of the Day. I could not believe my eyes and immediately began to negotiate with the seller, Classic Rides Factory, LLC from Calimesa, CA. 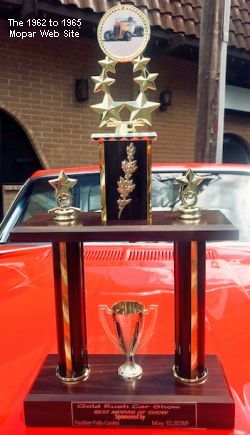 We agreed on a price and based on pictures, the right answers to my questions, I purchased it sight unseen and the seller set out to make it ready to transport to my location ASAP. 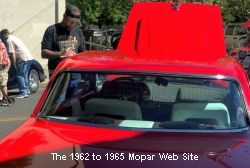 the Mopar was waiting for me when I returned from my month-long plus travel. 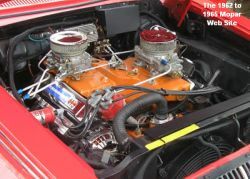 The engine is a 413 Max Wedge. 1852029 is the side casting number in 1962 for the Max Wedge 413. On this engine I can view 852029, though the leading 1 is not clearly visible. The rebuild is estimated to be at about 20,000 to 23,000 miles ago by an Los Angeles Max Wedge specialist, who since passed away. Brakes: 11 inch Disks (Front end from a 1973 Dodge Charger); 11 inch x 3 inch drums; Rear portioning valve is at the back, set at 60/40 or 70/30. Timing advance is 12 degrees before TDC. Fuel to be used is premium. Each tank full I add JP Racing 109 Octane to prevent dieseling. The Dodge arrived with two very small 6 inch air cleaners. 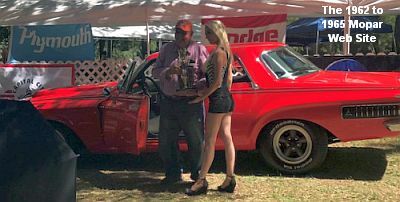 I first changed with 10 inch and then with the help of Mancini Racing I was able to obtain two 14 inch dropped down (1.5 inches) base plate to allow clearance under the hood. 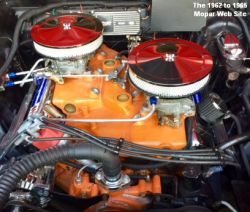 That improved the Mopar's breathing greatly, meaning better acceleration. The Dodge did not come without a few minor problems. 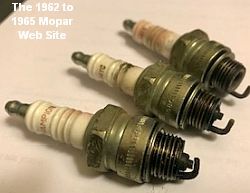 Apparently, the previous owner drove the car about 20,000 miles after the engine build and never changed the spark plugs. The engine was only firing on 5 cylinders. Pictured [right] you can see the plug gaps. The video below shows how the porcelain insulator in the plug hardest to access was loose and that cylinder made a chugging sound. Click to play video of loose spark plug insulator. The second problem was that the intake manifold was incorrectly installed; it was missing spacers and did not have gaskets at the heads -- just a thick glob of some type of sealant that had blown out in several places. 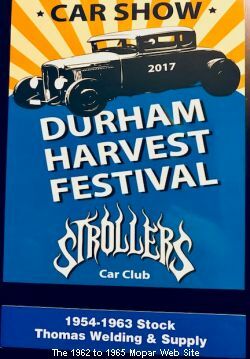 Vacuum levels and braking efficiency were consequently negatively impacted. Replacing the bad plugs and fixing the leaky intake manifold really woke up the 413. And with vacuum for braking, the Dodge stops well too! 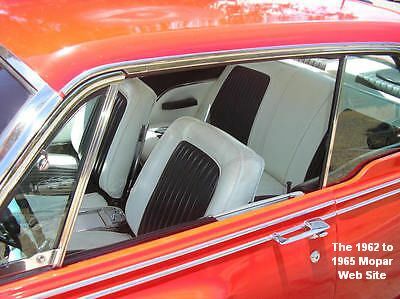 The third challenge was the missing 500 script from the passenger side door. It took me nearly two years to find the part. 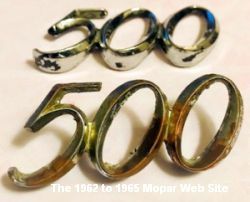 Using the resources of the 1962 to 1965 Mopar Website and associated 1962 to 1965 Mopar Mail List Clubhouse I was able find two scripts that needed posts added and re-chroming. Also, I replaced all the rubber bumpers, as well as the door, trunk and ignition lock cylinders so that one key works every thing. I got a carburetor synchronizer so both carbs pair perfectly. I installed new front and rear shocks; the Dodge tracks straight as an arrow. Once I began to have everything in good order, I decided to try and contact the previous owners. 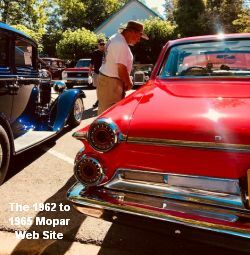 The one whom I purchased the Mopar from was not much help and due to some of the items not being well maintained I determined that was not a good source. 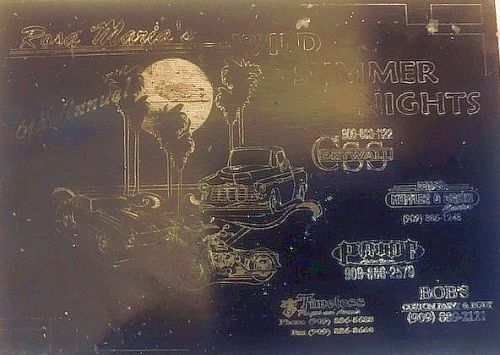 So I found an old car show plaque in the trunk, an Inland Mopar So. Cal. 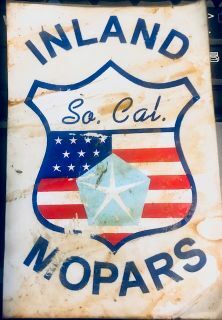 sticker and a 1962 license plate apparently used by the first restorer for car shows. 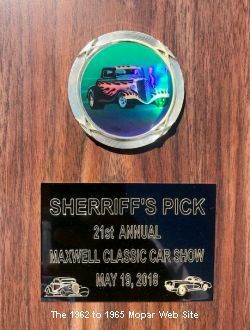 The car show plaque investigation came up blank. 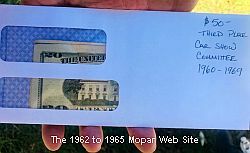 So I contacted the president of Inland Mopars. He questioned members of the club. 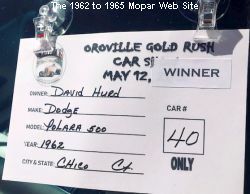 They did not remember the Dodge, but remembered the owner who was known as Susan Koch in August 2001; but there was a name change and the trail went cold. 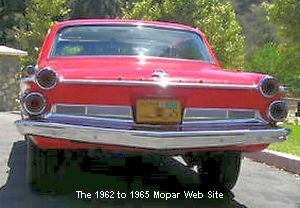 That is, until I clicked on the 1962 Dodge Polara section of B-Bodies on the 1962 to 1965 Mopar Website and found a web page from August 2000 posted for this Dodge. I now have the exact car, except I have black dice in the windshield now. 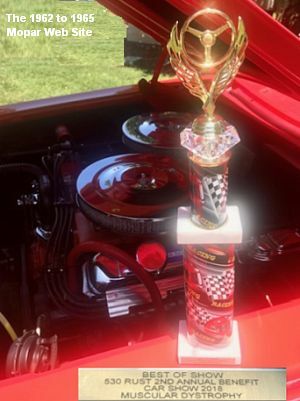 The judges are all over this 1962 Polara 500 at every show. 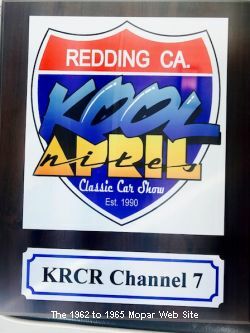 First show out the 1962 placed in the Circle of Champions at Redding Kool April Nites. 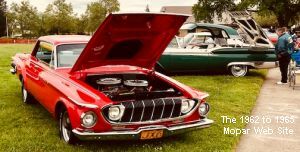 This was a totally Mopar meet. 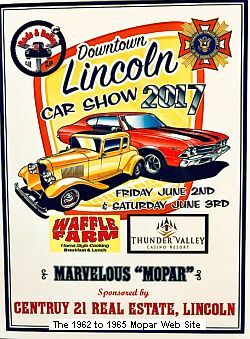 Mopars in the Park put on by Capital City Mopars. I picked the wrong category. I should have gone with B-Body. 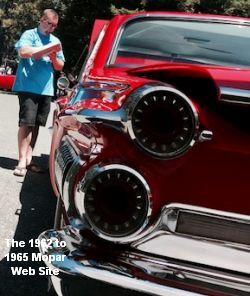 But I went with 1955 to 1975 which was a huge number of cars. 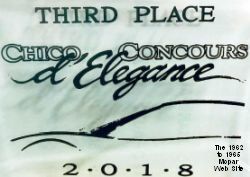 Getting third. 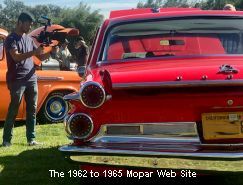 This show the Dodge was lumped in with every car from 1960 to 1969. 1st and 2nd place were both highly customized. 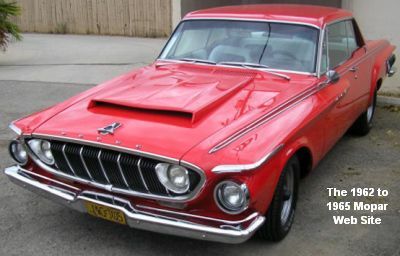 The 1962 Dodge is stock. 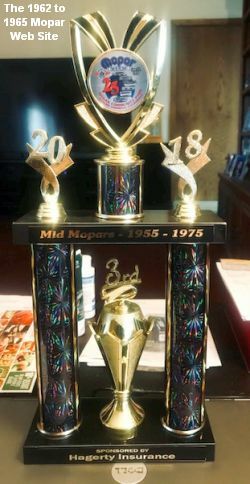 At the August 2018 Chico Concours d’Elegance car show a third place award was granted the Polara 500. 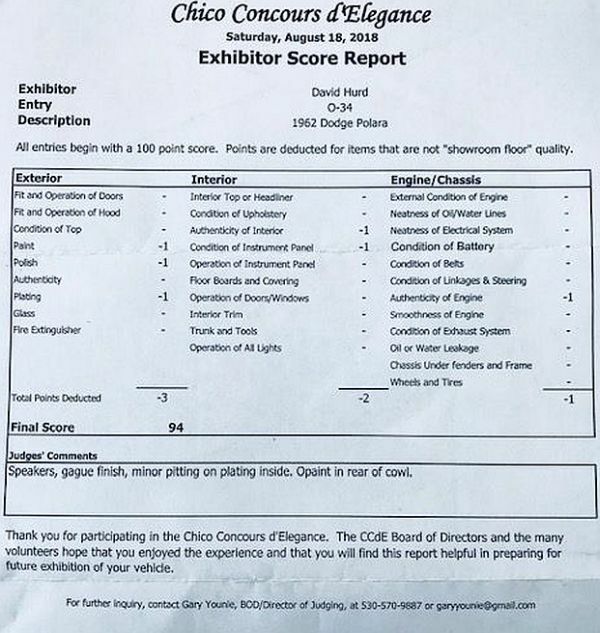 This was in a Concours setting with judging following Sports Car Club of America guidelines. 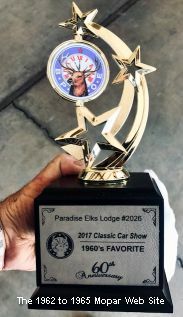 I was highly honored! Ask me if I am having fun – YES! 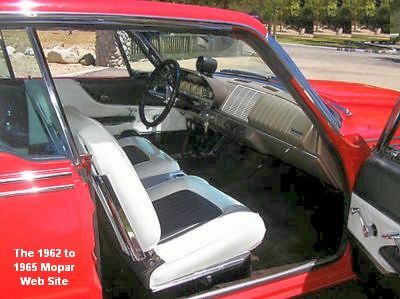 The bottom line is that this 1962 Dodge Polara 500 runs perfect! 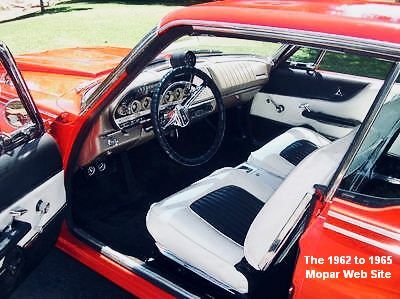 I have run the car back from shows at 105 degrees outside at 80 MPH for several hours and the Mopar does not miss a beat. Also, the Dodge does not loose a drop of any fluids. 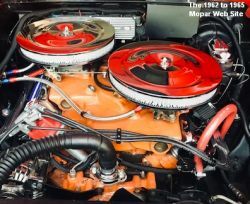 In fact, the Mopar runs super strong -- as several friends who have 425 3-2 Vets and a Chevelle restomod with an LS9 will testify: they cannot stay with the Dodge.